“bubi” (Budapest Bicycle) will be Hungary’s first public bike-sharing system, similar to already existing European models. It is to be operated by BKK, the Centre for Budapest Transport, the new transport authority of Budapest. An Information Day is to be held by the future system operator (BKK) in Budapest, on Wednesday, March 21, 2012. The one-day event will be structured in the form of a roundtable discussion about the most important aspects of the implementation and operation of a public bike-sharing system in Budapest. Due to the limited number of attendees, we would like to invite companies who operate or produce such bike-sharing systems. Contrary to what has been written in the news about the new City Streamer bicycle "PIBAL" for Bordeaux, France, it is not a replacement bike for the V³ bike-sharing system there. These bicycles, which were designed by Philippe Starck and manufactured by Peugeot at the request of the City of Bordeaux, will be used to replace the fleet of the city's long term bicycle loan system, Vélo Ville de Bordeaux (VVB). In addition to their bike-sharing systems, many French cities like Lille, Montpellier, and Strasbourg, have fleets of bicycles which the city loans to its inhabitants for longer periods of time. This is generally a rental period of three months to a maximum of one year. This information was confirmed by the V³ operator, Keolis and the City of Bordeaux. 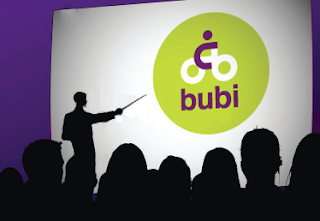 PIBAL is a very interesting bicycle. 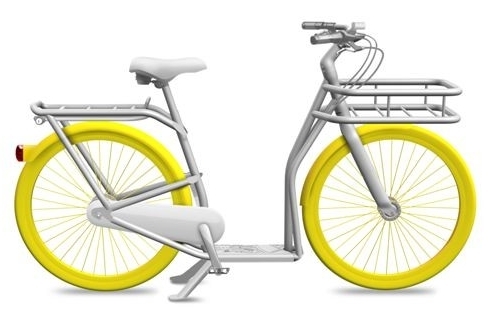 It will be built with fluorescent tires, a dynamo for front and back automatic lights, internal hub brakes and shifting, heavy duty front and rear racks to carry heavy loads, and it can be pushed as a scooter or ridden as a bike. Also, these bikes will be available for sale at around €300 ($400 US). According to the bicycle loan agreement for a VVB, it is not advisable to share! Is it ever too cold to bike-share? A rather mild North American winter and a pretty rough Central European winter is causing a lot of thought on whether or not to bike-share in winter weather. 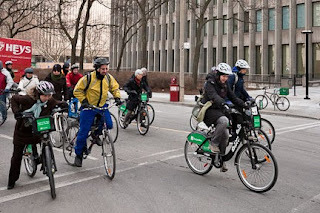 As was posted here on December 12, 2011, many bike-sharing systems around the world went into hibernation in December. A notable exception is Canada's Toronto bIXI. It has stayed open and enjoyed the milder winter. Last month, Toronto celebrated the "Coldest Day of the Year" bike ride. It was not very cold and one can see the bike-share bikes are right up front in the photo below. According to the Gazette, the spokesman for both the Montréal and Toronto bIXI systems, Michel Philibert, indicated that they will watch Toronto's experience, as that city embarks on its first winter with a bIXI service to determine if Montréal should stay open through winter as well. He also had respectable usage numbers for Toronto's system on the winter days that are above freezing. 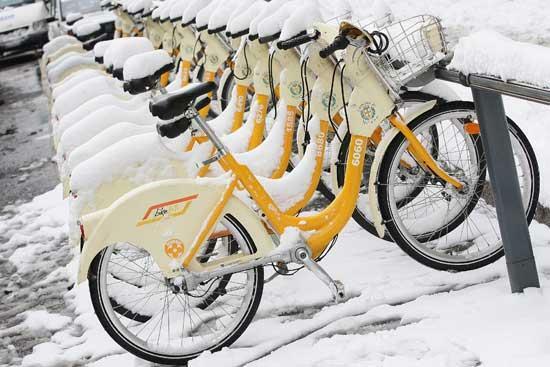 The most northern systems in Asia are the Tianjin Binhai New Area Public Bicycle and the pilots programs in Beijing, China which are open and operating in the winter cold. Although the most northern system in Europe, Trondheim, Norway's Bysykkel is in winter hibernation, the northern German city of Hamburg has StadtRAD rolling. 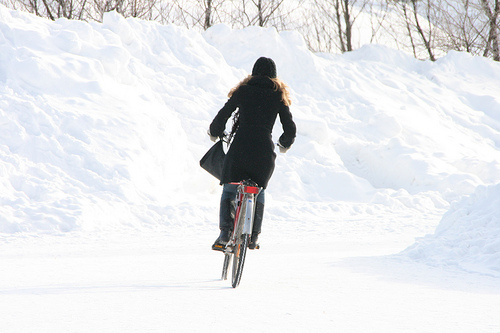 Even in winter with snow or just cold, it seems there can be bike-sharing in the world's upper latitudes. Not only latitude, but altitude also effects the weather. At the foot of the Rocky Mountains at 5,400 ft (1,650 m) above sea level, Colorado's Boulder B-cycle has left two of its stations open for the winter. The locations near the University Corporation for Atmospheric Research will test how the stations, bikes, and users fare in the extreme temperatures. They hope the lessons learned will allow year-round service. 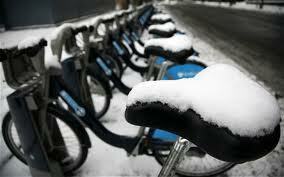 As for bike-share users, here is a link on tips from ICEBIKE for the winter cyclist. Enjoy riding in the snow, if you have some! 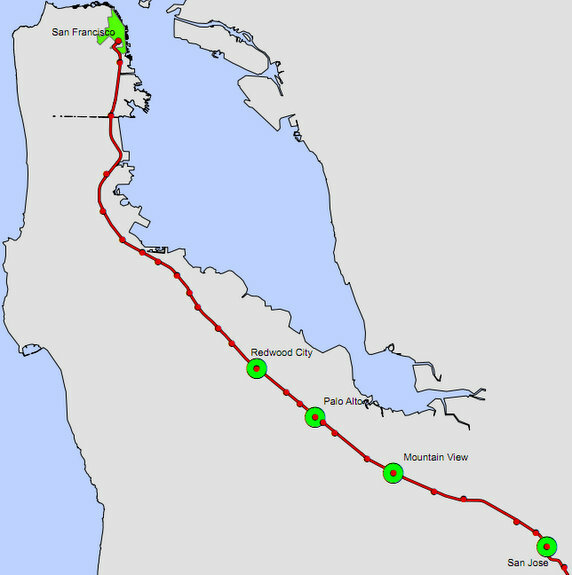 - San Jose with about 200 bikes in 20 Stations. The RFP calls for this pilot program to begin operation on July 1, 2012. This will be the largest bike-sharing system on the West Coast of the United States. It will cover a larger area than the regional systems of The New Balance Hubway around Boston and Capital Bikeshare around Washington, DC with less than half the number of bikes. Each on these cities of this pilot program are along the Caltrain rail system to facilitate easy commuting. The timetable called for in this RFP will make for a very interesting summer for bike-sharing in the USA. Within a month, Chicago, New York and now San Francisco are expecting to launch bike-share. Russell Meddin - ain't no bikesharephiladelphia(.org) for this summer! Why not Philly! The Bike-sharing World Map is the number one resource to find localities with bike-sharing. It was referenced over one million times in the last 11 months. While it took a few years to reach it's first millionth page views, it is now in constant use. We at The Bike-sharing Blog are delighted to bring you this service. For a new mode of transit and a fledgling service, Arlington’s portion of Capital Bikeshare (CaBi) finished its first year with a cost recovery rate that other transit providers in the U.S. would find admirable. The regional CaBi service launched on September 20, 2010 and Arlington’s portion achieved an 81% a 53% cost recovery – the ratio of revenues to operating costs – during its first year. Compared to other bikesharing services in the U.S., CaBi did well considering it was the only year-round service at the time. Compared to other modes of transit in the U.S., Europe, and Asia, CaBi fares well, but still has a way to go. Note: Percentages for the latter two do not include management and marketing costs. Arlington’s portion of the CaBi service had $218,000 in revenues (from memberships, user fees, and sponsorships) and $270,000 in operating expenses from Alta Bicycle Share. Additionally, marketing and management costs were $142,000 for a total Year 1 expense of $412,000, which equates to revenues covering 53% of program expenses. Operating expenses were $155 per bike per month. If not including marketing and management expenses, then Arlington's cost recovery is 81%. We’ve blogged about bikesharing being an economical transport mode for both customers and local governments, but now we have the data to document it. 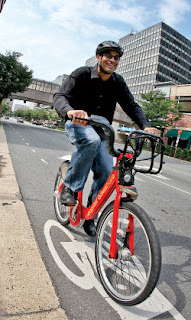 CaBi began operations with 14 stations and 110 bikes and completed its first year with 18 stations and 113 bikes. Only three bikes were needed to be added as the service shifted from a 67% bike-to-dock ratio to 50% to improve bike balancing operations. Arlington’s portion of CaBi benefitted from being a regional service with D.C.’s 100 stations. We’re well into our second year and now up to 23 stations and 145 bikes. Service expansion is continuing in the Rosslyn-Ballston corridor with 21 more stations and 144 more bikes coming online in the spring, nearly doubling the size of Arlington’s service. Additionally, we have funding to add another 25 stations in FY13. We look forward to increasing CaBi’s impact in the County by reaching more neighborhoods and folks, making CaBi an integral part of everyone’s lives – whether you live, work, or play in Arlington.